Crypto has been moving fast, and from the inside looking out, it’s all-too-easy to forget that a large percentage of the population don’t fully understand blockchain technology, and often approach crypto with caution. Despite this, the maturation of the blockchain industry is slowly taking place. But to meet demand and onboard new crypto users, apps with high usability are now more crucial than ever. Meeting the needs of this diverse and changeable crypto-community isn’t easy, but that won’t stop the team at Eidoo from creating the ultimate blockchain asset experience, available to everyone – cryptographic expert and newcomers alike. 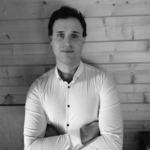 Blokt had the chance to speak with Eidoo director Thomas Bertani, blockchain exchange and smart-contract industry veteran, to find out what it’s like to be building a hybrid, hyper-accessible cryptocurrency platform, where he sees the future of cryptographic assets heading, and Eidoo’s exclusive sponsorship of a legendary motorsports event. The Eidoo app allows users to store, buy, convert and invest in digital assets, initial coin offerings (ICO) and security token offerings (STO). Within Eidoo’s app, users can access a Bitcoin and Ethereum wallet, including all ERC-20 and ERC-223 tokens, a hybrid exchange to trade cryptocurrencies, and an ICO-engine which allows participation in third-party token sales. In addition, Eidoo is also building a crypto to fiat exchange and implementing credit card technology to make spending crypto as easy as spending any other currency. Since 2017, Eidoo has launched over 15 ICOs in Switzerland, including its own which raised US$28 million. When users participate in an ICO via the Eidoo platform, the tokens are simply deposited straight into their Eidoo wallet. Naturally, users can buy EDO through the Eidoo exchange; however, EDO also trades on HitBTC, Bitfinex, Binance, and OKEx. What is the Eidoo Hybrid Exchange and Wallet? The Eidoo exchange is ‘hybrid’ as it seamlessly combines the functionality and benefits of both decentralized and centralized trading platforms. Additionally, through a unique collaboration with Oraclize, Eidoo is implementing “authenticity proofs,” which show that order matching is carried out in a fair and transparent manner. The Eidoo sponsored car, pictured above, might be Mini, but it’s sure to catch attention on the track. 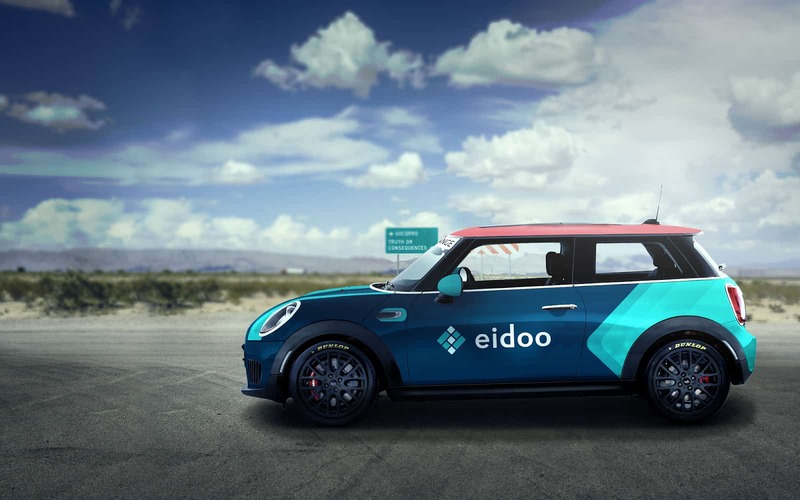 In a blockchain industry first, Eidoo is an official sponsor for the Mini Challenge 2019 in Italy, a legendary event on the motorsports calendar. Throughout the 3-month long tour, Eidoo will be sponsoring a John Cooper Works Challenge car, driven by Federico Alberti. The car will feature full Eidoo branding and unique Eidoo colors. The Mini Challenge 2019 fires off in Monza on the 7th of April, driving full circuit around 12 other high-octane races throughout Italy, before finishing back in Monza on the 21st of July. The Eidoo logo and brand image appearing at such a landmark event will promote global awareness for the Eidoo app and EDO token, in addition to driving blockchain adoption. Eidoo believes that all blockchain companies have a duty to set best-practice examples by using distributed ledger technology responsibly. This is part of the impetus behind Eidoo’s rigorous approach to user privacy – the Eidoo app never stores private keys, nor tracks its users with blockchain analysis tools; creating an increasingly trustless and transparent environment. The Mini Challenge 2019 is the perfect event to unveil the #SpeedNeedsDirection movement. Mini events attract viewership in the millions from worldwide locations, primarily in the US, Europe, and Australia, and represent an important demographic for blockchain adoption, in terms of age group, interests in finance, investments, and technology. What Does the Future Hold for Eidoo? With the beta testing phase of the Eidoo hybrid exchange successfully concluded, Eidoo finished integrating its exchange features with its app on the 30th of January. Bertani shared with Blokt that during the beta testing phase, as no significant bugs were identified, the team instead focused primarily on their key goal – development of a 100% user-friendly application, facilitated through a feature-rich UX and UI, which can be used by anyone. 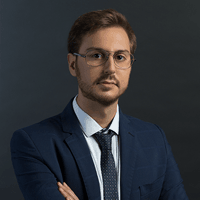 While Eidoo already has an impressive number of assets on offer, including Ekon, Eidoo’s very own gold backed stablecoin; we asked Bertani if there are plans to offer more assets, such as security tokens, via the Eidoo hybrid exchange in the near future. Stablecoins, like Ekon, aren’t subject to volatility, and fiat currencies can be exchanged for stablecoins and kept in this form, so they’re immediately available to be traded for cryptographic assets. 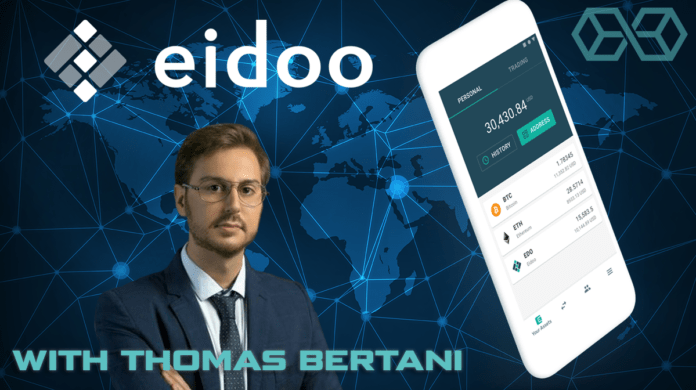 Bertani also shared with Blokt that the Italian digital entrepreneur and influencer, Marco Montemagno, will be joining Eidoo to create a video series educating people about cryptocurrencies. Likewise, through Eidoo’s holding arm, they’ve established a magazine called “Cryptonomist.ch” to help avoid fake news and spread understanding of the importance of decentralization. Next articleIOTA Price Prediction: Are Further Increases to Be Expected for IOTA?